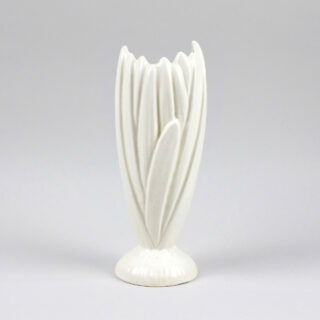 This SylvaC vase is one of the taller versions of this design that Sylvac made in their Staffordshire pottery in the late 1950s/early 1960s. The ‘hyacinth’ pattern was used across quite a few different pattern designs from tall vases such as this one to low level posy vases and mid-sized planters. They also made the design in a number of different colours: cream, yellow, fawn, light green and dark green. The pattern reference on this version is not clear enough to be read. This vase is in good condition with no chips or cracks.